Over the years, I’ve actively sought opportunities to get different perspectives on things. So, each January I visit the Future of Education Technology Conference when it rolls through Orlando to see what’s up in the education industry. There were over 10,000 attendees this past week. Breakout sessions included all manner of talks on innovation and creativity, running classroom programs and specific techniques for teaching students of all levels. My schedule only permitted a few hours on-site, so after checking in at the press room, I headed over to talk to people on the show floor. My focus there was finding education-centric physical computing gadgets, nano-Linux systems, DIY/Maker-related products and interesting uses of technology. Walking around the show, it’s obvious that the teachers, administrators and vendors are absolutely passionate about providing the best possible products and tools to help all the little off-the-shelf hackers of the future. That’s a good thing. Here’s a rundown on what caught my eye. The Pi-Top is a Raspberry Pi-powered notebook. Naturally, it runs Linux. It has an LCD panel, keyboard and add-on board for audio and interfacing to their educational accessories. Claimed up-time on battery power is about eight hours. The keyboard and touch-pad slide down to let you access the Pi board and accessory prototyping area. There, you can add a traditional experimenter’s board, a speaker and other parts. It’s a novel platform for building circuits and learning about physical computing. The Pi-Top retails for about $320. Pi-Top is all about educating inquiring young minds on physical computing. Their Pi-Top Inventors kit packages up a handful of discrete parts, like resistors, LEDs, a photocell and ultrasonic range finder and teams it all up with a series of educational courses. Students build the projects and learn about programming, electronics and physical computing as they go. They’ve even bundled 30 Pi-Tops and Inventor kits into a self-contained compartmentalized rolling cart, that’s geared for the classroom. The cart, with all the parts, Pi-Tops and accompanying curriculum goes for about $30K. Shaper is billed as the world’s first hand-held computer numerical control (CNC) machine. It’s a router, like what you’d use to cut out shapes in plywood or finish off the edges on cabinetry. 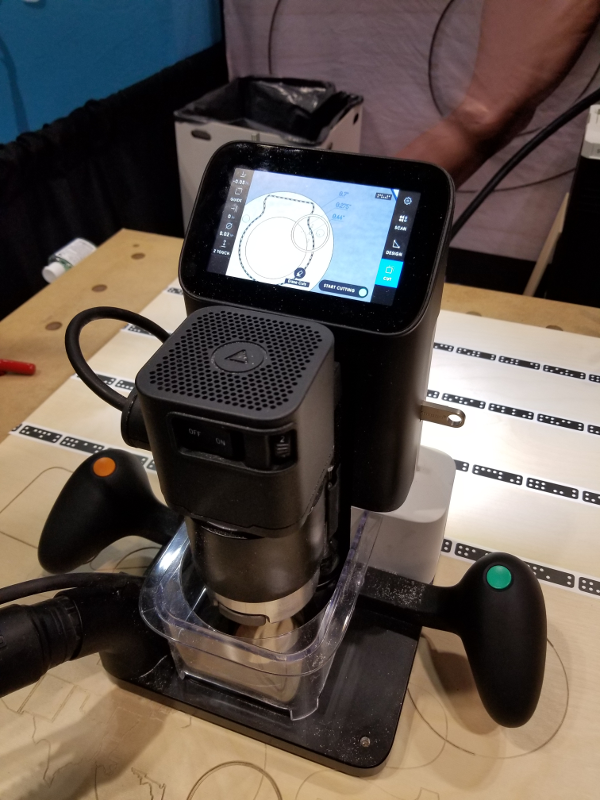 I see the Shaper tool as a smart augmented physical computing device. To use Shaper you first stick down some of their custom locating tape to the work-piece. Cameras in the Shaper then track the markings on the tape to determine and adjust the cutter’s exact location, on-the-fly. You can download two-dimensional designs into Shaper or design as you go, using onboard software tools. Several stepper motors, cams and a custom electronics board, with input from the cameras, keep the cutter on the correct path. It will compensate for your “by hand” tool guiding within about a quarter inch. If you stray too far off track, the cutter will retract so you don’t ruin the part. Just put the cutter back on the path and it will pick up where it left off. Slick. Can you use steppers, a microcontroller and some mechanisms to augment human inaccuracy, in your interactive projects? It definitely deserves a bit of thought. 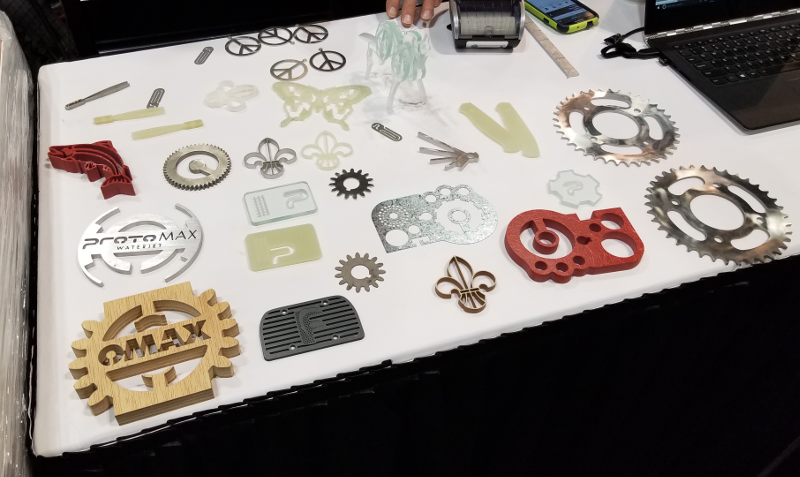 There must have been two dozen 3-D printer vendors, this year. 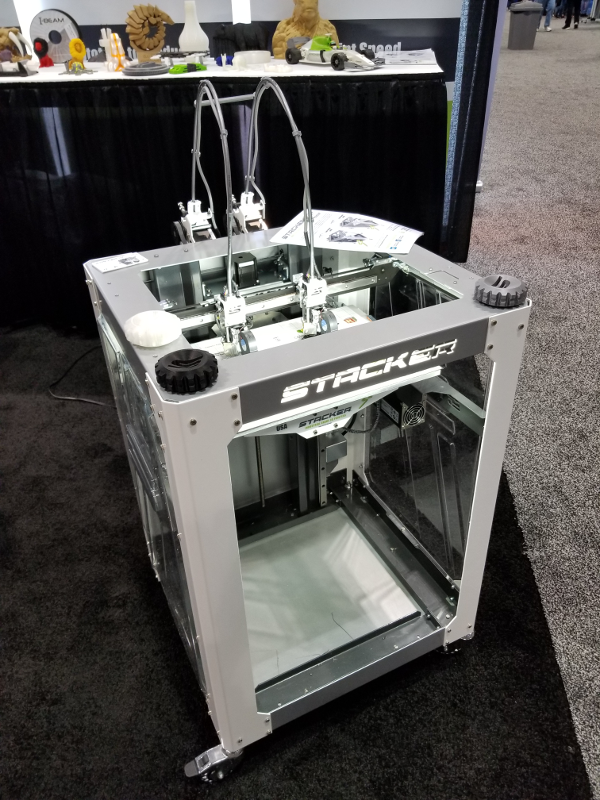 What made the Stacker different than everybody else is that this industrial-strength 3-D printer can run up to four print heads at once. Feed mechanisms are attached to the frame and just the heated print heads are moved by the XY mechanism. Wow, that makes total sense. Why didn’t I think of that? Could you do 10 or 20 print heads? Something else to ponder. The product is a fine example of lateral thinking and hopefully, the lesson won’t be lost on junior engineers of the future, who have one of these in their classroom lab. Turning out multiple parts at once, should also subtly get young inventors thinking about manufacturing and production implications when they come up with their own designs. Everybody always talks about “scaling up,” right? Here it is physically. I remember occasionally passing the gigantic abrasive water jet when I worked at Martin-Marietta. The darned thing took up a whole 15′ X 15′ room with its robust framework, plumbing and pumps. It was horrendously loud. 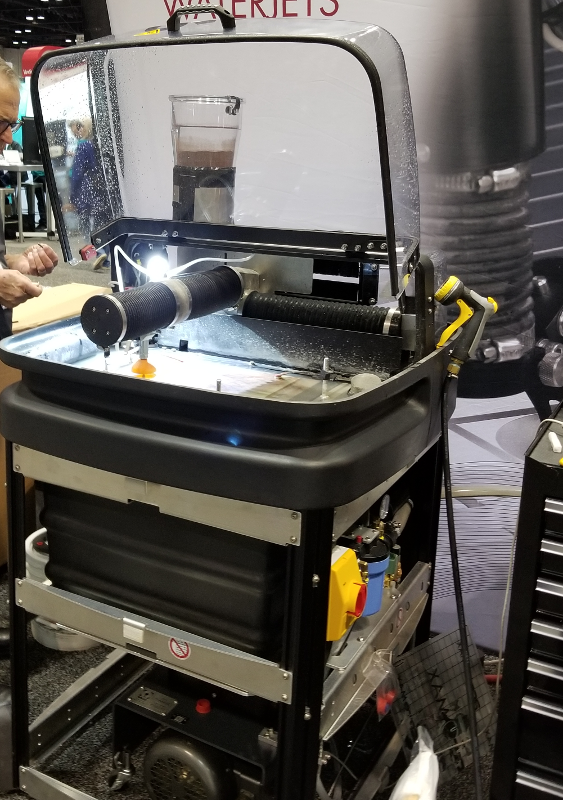 OMAX showed their personal-sized abrasive water jet, called the ProMax at the FETC show. The wheeled machine was about half the size of a residential refrigerator, housing the pumps and control parts on the bottom and the cutter mechanism at waist level. Although the machine wasn’t running when I walked by, parts that it produced were spread out on a table and looked nice, with excellent fit and finish. Who knows how much that big, monster machine back at Martin cost. The salesman said the OMAX goes for about $20,000. To me, in a maker or small-scale manufacturing education program, the cost seems reasonable. Think about what you might have made in class, years ago, if you had a table-top abrasive water jet to play with. And where will students be 20 years from now, with access to this kind of technology today? Going to “out of comfort zone” conferences and events gives me a new perspective on the world. I like to see how people integrate the latest technology into their particular areas of expertise. Be curious, flashback to first grade, then look in a different cubbyhole.